Le Moyne College Provost Fr. 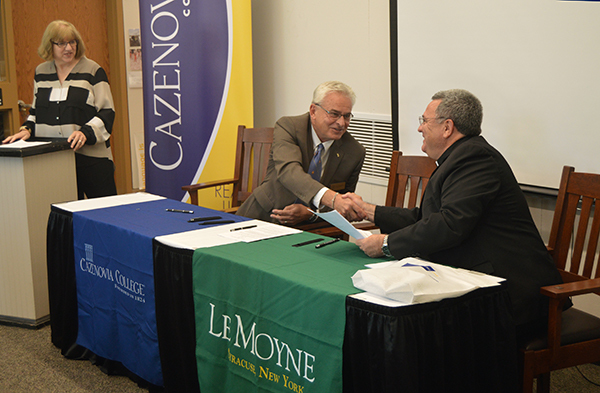 Joseph Marina and Cazenovia College President Ronald Chesbrough signed an "accelerated path" agreement to attract Cazenovia students to Le Moyne's master of science in arts administration program. The agreement was signed on Wednesday, September 13, at a ceremony taking place at the Jephson Campus A Building Seminar Room on the Cazenovia College campus. The agreement gives Cazenovia students the opportunity to begin course work in Le Moyne's masters in arts administration program during their final year of undergraduate studies at Cazenovia. They will apply for admittance into the Le Moyne program during their junior year, then take one course per semester in the program during their senior year at Cazenovia. Those accepted will not have to provide a GRE test score and will have their application fee waived. "Le Moyne's masters in arts administration has quickly become a much sought-after degree, and the job placements of those who have completed the program have been impressive," said Le Moyne President Linda LeMura. "We are excited about this partnership with Cazenovia College and look forward to being an option for Cazenovia graduates seeking to pursue graduate study in arts administration." "We're excited to once again partner with Le Moyne College to offer our students the opportunity to pursue an accelerated master’s degree," said Cazenovia College President Ron Chesbrough. "Our undergraduate programs provide a strong foundation for students interested in a career in arts administration and we’re pleased that they will now have the opportunity to continue on to receive a masters from Le Moyne in one year." Started in 2015, Le Moyne's Master of Science (M.S.) in Arts Administration is a 36 credit program that offers an opportunity to study and apply management concepts in an arts environment. An interdisciplinary program, students will study marketing and fundraising, learn to collaborate with a board of directors, understand how to interpret financial documents, and gain perspective on managing a creative workforce. Practical application is a hallmark of the program, which places students in consultancies with area arts and culture organizations. Students also have the opportunity to travel to New York City on a regular basis to meet with arts leaders. A global perspective is woven throughout the program, and students are able to explore the global arts industry through a course that includes travel to Edinburgh, Scotland, and London, England. The agreement marks the second between the two institutions; in 2014, the colleges announced a 4+1 agreement that provides Cazenovia students and graduates with a formal path to admission into the Master of Business Administration (MBA) Program at Le Moyne. The accelerated path agreement became effective for a period of five years starting with the 2017-2018 academic year. For more information on the program, visit www.lemoyne.edu/artsadmin.